During the recent World Water Week in Stockholm, the Directorate General for International Cooperation (DGIS) of the Netherlands Foreign Ministry and IRC International Water and Sanitation Centre organised a joint side event in the Sheraton hotel in downtown Stockholm to present and discuss findings from two major reviews, one from the Ministry evaluation office looking back at 20 years of Dutch assistance to the WASH sector and a second recently completed review of the sustainability checks applied by DGIS in its WASH funding over the past five years or so. We were situated in a room directly opposite the stop-over point of President Obama’s flying visit to the city, en route to a date with destiny and Mr. Putin in Moscow, and had a grandstand view of the traffic chaos and throngs of gawking celebrity seekers that only such a high profile visitor can attract. Global political super-stars aside, there were plenty of high-profile WASH sector technocrats and policy makers from a range of governments – Dutch, Swedish, British, Canadian – and of course a wide smattering of the Dutch WASH NGO and intelligentsia communities thrown in. This was a fitting moment to share the results of the sustainability check review, as one of the main instruments of the DGIS sustainability clauses that were heralded a year ago during SWWW 2012 by my friend and colleague – and now the new Director of IRC – Dr. Patrick Moriarty, who wrote a great blog that celebrated the introduction of the clauses as a ‘champagne moment’ for the sector. He said at the time that although such clauses could be seen as going against the flow of aid alignment principles, at least DGIS was doing something to push the sustainability issue up the agenda. And of course so it has come to pass and this move has forced those big recipients of Dutch tax euros (the likes of UNICEF and the Global Sanitation Fund managed by the WSSCC) to respond and react. As much as the Dutch as a bi-lateral donor needs these high capacity organisations to channel and implement funding, so too these agencies need Dutch money to maintain their programming objectives. Firstly, in spite of many issues and technical challenges, the Sustainability Checks carried out to date have had a positive impact and have generally been a force for good. Yes, there were issues with indicator definitions and sampling approaches, and we can all always improve our game, but by and large the checks have served their purpose, have forced these agencies to focus on sustainability (but not necessarily always taking remedial action) and have delivered DGIS with a reasonable picture of how their aid funding is faring. Are the checks perfect? Far from it, but this is one of the largest and most comprehensive experiences to date of a major bi-lateral donor in the sector attempting to use contracting instruments to improve the impact of programming on the ground and DGIS should be rightly praised for this effort. As a result of their actions – which received fierce criticism from some quarters – more people in more organisations are thinking about sustainability, are modifying their design and programming approaches and are doing more to report on their impact. This surely is a good thing, so well done DGIS! This brings me to my second takeaway from the presentation, which is much less rosy. By and large – and with one real exception in the case of Rwanda – these checks have been designed, executed and reported on as stand-alone, ‘projectised’ exercises. Across the 17 checks that we looked at very few had the real involvement of government and the results were an upward exercise in accountability from contracted auditor, to implementing agency to funder. The findings and results of the checks were shared with government, but because of the underlying premise of the checks and the way they have been designed, these are much more relevant to DGIS-funded partners, rather than national stakeholders. The Sustainability Checks are a donor-driven initiative doing little to support real capacity building in terms of national monitoring and even less to enable local government to do anything about the results when systems are shown to be failing on the ground. In fact, as things stand, they may actually be a perverse incentive for aid agencies to retain presence and a parallel capacity to go out and ‘fix’ these systems in an attempt to appease their donor. In terms of aid alignment principles, this is a bad example of how to support sector systems and processes or to encourage national ownership. So has the Dutch development ministry failed or done wrong? I don’t think so. This is another big step in moving toward improving the way we think about and measure the success of our support to developing countries in the WASH sector. One of the original aims of DGIS was to find out whether their tax euros were working effectively, promoted largely by the boot of public opinion on their neck and the Dutch parliament asking hard questions. And, whilst many in the room quite rightly called for greater accountability to national governments (as we do in our report), a little bit of me also thought about accountability to me as a tax payer; as an individual and business owner in the UK, I pay at least five different sets of taxes from personal income to VAT and I am happy to do so. But I also know a small fraction of that tax will end up going into the overseas aid ‘pot’ and an even smaller slither will end up somehow supporting DFID’s WASH programming or the EU Water Facility and I too want to know that this tax revenue is being spent wisely – so in some small measure I agree that we should find out if our aid is working well and this instrument, with modifications, could be one means to assessing this. A much bigger part of me however is a true believer in the aid alignment principles; the only way to go is in the end with support to national systems and here is where DGIS – together with its implementing partners (and hopefully government partners in the south as well) – needs to make some tough decisions to get with the programme and get behind coordinated, sector-wide mechanisms that can make monitoring of WASH sustainability sustainable. Let DGIS keep a quick and very focussed technical check on functionality to report back to their political masters if they need to, but don’t dress this up as anything else. Following the two presentations there was a good dialogue and debate in the room which exposed some interesting – and possibly stereotyped – responses from other bi-laterals. The Americans voiced strong support in principle for such a tool (and indeed USAID is developing a sustainability assessment tool of their own) but when pressed, admitted that in such a litigious society, holding implementing partners to account for long-term outcomes simply would not fly. The British representative from DFID stated categorically that this is the ‘wrong tool’ to promote long-term sustainability and that the main thrust should be around supporting broader public and private sector capacity going beyond simply the WASH sector. And while I agree with this wholeheartedly and DFID indeed puts a lot of money into improving governance and strengthening local government, I could also not help but wonder that at the same time DFID have launched a major Results Challenge Fund to reach 7.1 million people with access to improved WASH by December 2015 – an aim that is highly ambitious and will be extremely challenging in and of itself, if at the same time building that capacity and ensuring that elusive sustainability element, which is an observation that many of us in the UK WASH space have been saying for a while. The UNICEF representative agreed broadly with the instrument and the concept of a clause, but questioned how this would be structured and stated that it is in the end only national governments that should be held accountable. Again, I would agree in principle and in an ideal world, but equally UNICEF receives huge tax payer funding from many countries and cannot simply side-step the issue when at times their own programming has quite a bit of shall we say ‘clear blue water’ between it and national government systems and structures. Partly in response to all the pressure from DGIS, and through their own experiences and thinking, UNICEF has come up with a Sustainability Compact which brings national governments into the equation in a very real way from the outset; again, this is an iteration of experience around sustainability which is to be applauded. So at the end of the day, for all the issues and problems with the Sustainability Checks and Clauses, DGIS has put a marker in the ground, has pushed the debate and has stimulated strong reactions, both positive and negative from a range of different quarters. Looking back over more than two decades of working on these issues I can take the long view and say that the fact that these instruments exist, and that we are having these at times fierce debates, is itself a sign of progress. We are moving forward. We are developing and testing the tools and methods we need and we are building experience base. And we must keep innovating and increasingly put national governments in the south in the driving seat – and yes, hold them responsible for delivering these most basic of services to their citizenry. So, as for the Sustainability Checks – with warts and all – hats off to DGIS for giving us all a resounding kick up the rear end! ← Warning: danger zone ahead! Or not? Full disclosure: Aguaconsult has been approached by consortia interested in bidding on the DFID Results Challenge Fund – and may take part. We will in that case be focusing particularly on sustainability elements. @ Harold Lockwood – very interesting. Thanks for the great post. I guess the ideal would be a tool that could allow DGIS to report back and also be able to hold national governments accountable. Working in the field in the South I do identify much with sustainability as a big issue and have spent some time agonising over investments that fail to provide sustainable services and wondering how one could address this [because money does not grow on trees, and will not always be there]. I do think though that starting with the agencies that the funding is channeled through is a good starting point but to yield the ideal results we need to understand why the national institutions tasked with delivering this service are not where we would like them to be (ensuring the sustainability of the services that aid supports) or even that they initiate at times. So yes, hats off to DGIS and hope the initiative will go further and begin to explore how to bring national governments to the table/equation. @HaroldLockwood I agree that noting that these sustainability checks are really part of the relationship between the donor and the implementing partner and not so much part of the relationship between the recipient country and its citizens is really important. Once the project is over and the managed infrastructure is handed over, there has got to be a healthy amount of feedback between citizens and the service provider. As such, I see these sustainability indices, checks, etc as complementary to and not replacements of well-functioning accountability and service delivery frameworks (a la WDR 2004)..perhaps even participatory budgeting, etc. Maybe if donors graded recipient countries on how well service provision is maintained after the implementing partner has left and such a grade affects future lending, that might improve things. Unfortunately, there is no easy fix/substitute for citizen voice, purchasing power, etc. 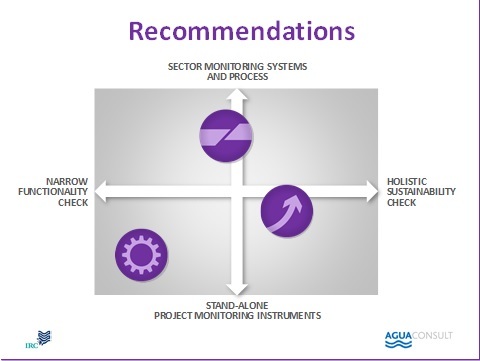 The next step is surely to move forward from programme/project sustainability checks to sector monitoring of service delivery, including of effectiveness of inputs from external partners.